Each year, the Missouri FFA elects a state officer from each of its 16 Areas. A good portion of those officers end up at the University of Missouri to further their education. The College of Agriculture, Food and Natural Resources is home to the current state FFA president, Abby Bertz, and three past state FFA presidents, Colton Spencer, Adam Kirby and Cole Edwards. Photo by Logan Jackson. The University of Missouri College of Agriculture, Food and Natural Resources and the Missouri FFA are both focused on preparing students to address the most challenging problems in the world today. 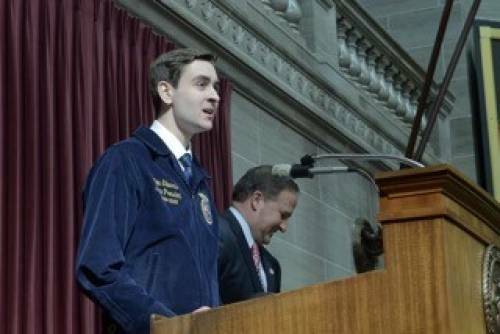 Each year, the Missouri FFA elects a state officer from each of its 16 Areas. A good portion of those officers end up at MU to further their education. CAFNR is home to the current state FFA president, Abby Bertz, and three past state FFA presidents, Colton Spencer, Adam Kirby and Cole Edwards. Abby Bertz basically became a member of her FFA chapter as a seventh grader. With an older sister involved in the organization, Abby and her twin sister Alli tagged along, taking in the offerings. Agriculture is rooted in the Bertz family. Bertz is the seventh generation on a working row crop and cattle operation. She showed and raised pigs as part of her 4-H project. Once Bertz joined the Odessa FFA, her supervised agricultural experience (SAE) project focused on the row crop operation, as well as fruit production. She worked at Fahrmeier’s U-Pick Produce Market, where she helped individuals who visited the farm to pick strawberries and blackberries, among other items. 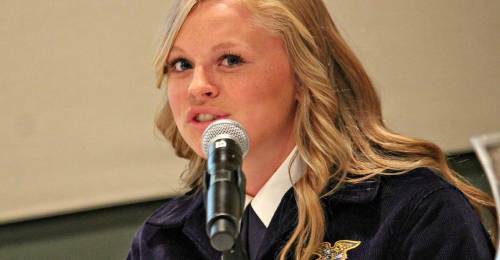 It was at FFA camp where Bertz really found her passion in the organization – public speaking. Bertz competed in numerous public speaking engagements throughout her FFA career. Bertz and her sister were also part of a Livestock Judging team that advanced to state competition. Bertz knew she would run for state office early on. She made the decision during that first FFA camp. “There were four state officers there, and they made such a lasting impression,” Bertz said. “In that moment, I wanted to be just like them. To personally connect with them was amazing. It made me want to take advantage of those opportunities. Like other FFA members before her, Bertz enjoyed her opportunities on the Mizzou campus as a high school student. That made Mizzou an easy choice. Bertz is an agribusiness management major and is minoring in Spanish. She is hoping to do international work after graduation. Bertz is part of the Ag Business Club, Collegiate Farm Bureau, True Tigers and Alpha Delta Pi. She is interning in UM System President Mun Choi’s office. Bertz is doing government relations work, including taking committee hearing notes at the capitol in Jefferson City. The Spencer family has two traditions that have been passed from family member to family member – participate in FFA and attend the University of Missouri. Colton Spencer has made sure to keep those traditions alive and well. Spencer’s father served as an agriculture teacher for nearly 27 years in Aurora, retiring last year. His father was a state officer in the FFA while in high school, and Spencer’s sister was the first state vice president in 2012. The Spencer family runs a beef cattle operation, which is how Spencer got his first taste of the agricultural world. Spencer served as the state president during the 2016-17 campaign. He’s serving in a mentor role with the current state officer group. Spencer’s SAE included the beef cattle operation on the family farm. He also worked at a local hardware store and participated in advocacy, working to spread a positive message of agriculture. Competitive teams were Spencer’s forte. He participated on the FFA Knowledge team as a freshman, finishing seventh at state competition; the Horses team he was with as a sophomore won a state championship; his Livestock Judging team finished second at state his junior year; and he finished his team run with a bang as a senior, winning state in Farm Management. The Livestock Judging team had an opportunity to go to Scotland and compete as well. When it came to choosing Mizzou, Spencer had no problems making the decision. He is the 28th member of his family to step on the MU campus. Spencer was already acquainted with the MU campus because of FFA. State FFA competitions take place at Mizzou each year. “You get to feel the atmosphere on campus every time, and you get to meet a lot of great people,” Spencer said. As an agricultural education major, Spencer is hoping to follow in his dad’s footsteps. He would like to become a high school agriculture teacher after graduation. Spencer is involved in Collegiate FFA, Collegiate Farm Bureau and serves as a CAFNR Ambassador. He is the president of True Tigers, a student alumni organization. 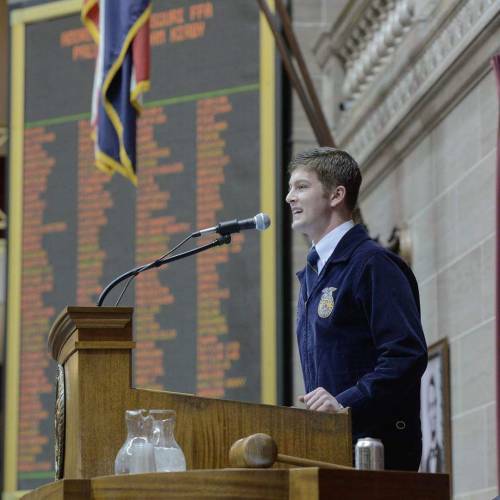 While Adam Kirby grew up around agriculture, he didn’t know how much his FFA chapter in Trenton would impact his life. His parents and grandparents had cattle and row crop operations – and Kirby thought the agriculture class made sense when he became a freshman. Kirby was still active with the competitive teams. He participated in public speaking competitions all four years and was a part of four different teams – Dairy Foods; Meats; Farm Management; and Agriculture Sales. Kirby’s SAE projects were incredibly diverse. He had cattle and sold sweet corn that he grew in town. Kirby also operated a hunting outfitting club. Kirby was serving as an area officer when he started thinking about making a run at a state office. “I was really enjoying it, so I wanted to see if I could step it up a notch,” Kirby said. Some of Kirby’s favorite parts of being a state officer were the chapter visits to various high schools. FFA also helped lead Kirby to Mizzou. While he had a basic understanding of where he wanted to attend college, being able to see the Mizzou campus at least once a year as a high school student made a big impression. Kirby is an agribusiness management major. He began his collegiate career as a biochemistry major but switched to agribusiness management. Kirby works for the Missouri Corn Growers Association in public policy. He interned at the White House in Washington, D.C., last semester. Kirby is involved in Collegiate FFA, Collegiate Farm Bureau and the Phi Sigma Pi honor fraternity. Cole Edwards was involved in 4-H from an early age. The next logical step, according to Edwards, was to join the FFA. Edwards is a third generation member, who grew up on a family farm, which consisted of corn, soybeans and cattle. Edwards’ SAE project focused on the agriculture offerings at his family farm. He had his own registered Hereford cattle and was involved with the corn and soybean operation. Edwards participated in several FFA competitions as well. 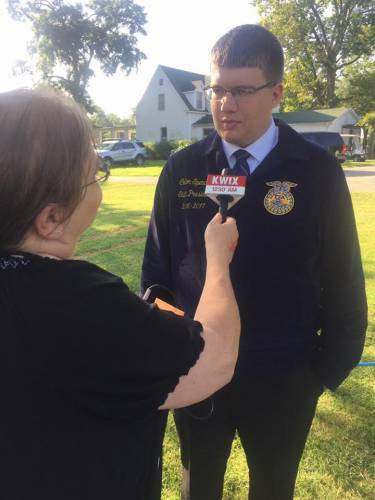 He was part of his chapter’s FFA Knowledge team, and was also on the Livestock Judging and Meats Evaluation teams. Edwards was also a regular in the public speaking competitions. Edwards was extremely involved as a chapter and area officer. That involvement led him to consider state office. Edwards comes from a family of Mizzou grads, so the decision to attend MU wasn’t a difficult one. Although his mom did try to steer him toward another university. Edwards’ two biggest interests are agriculture and politics – making agricultural economics the perfect choice for a major. Edwards has interned at the state senate in Jefferson City and the U.S. House in Washington, D.C. He returned to D.C. this past summer as Monsanto’s government affairs intern. Edwards’ internship opportunities came from hard work in the classroom. One of his favorite, and most beneficial, classes was with Scott Brown, he said. Edwards is part of Collegiate Farm Bureau, Alpha Gamma Rho and the MU student recruitment team. “MU is a great university,” he said. “CAFNR has also been awesome. It’s just the right fit. When I visited, my gut feeling was of belonging. This is where I wanted to be.